First part of an exciting and sweeping chronicle (campaign). Publisher's blurb: "Welcome to San Francisco, site of the resurgence of fae on Earth. This city is perhaps the most important to the fae, for the Glamour is more powerful here than any place on Earth. No other city contains more freeholds and magical sites than the Shining City. "The first part of the Immortal Eyes trilogy, The Toybox, picks up where 'Toys Will Be Toys' left off. 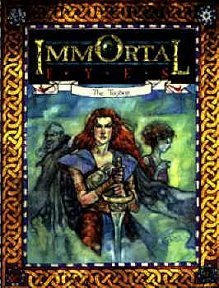 The Immortal Eyes chronicle combines a trilogy of novels with a series of game sourcebooks. This first chronicle for Changeling: The Dreaming blends rich backgrounds and settings with the lavish characterization and tightly woven plots that only fiction can provide. In so doing, the Immortal Eyes chronicle will immerse players and readers alike in the mystical world of the Dreaming."